We’re equal opportunity noshers at The Break. Baked goods, sweet treats, hand crafted candies…we’ll take them all and maybe have a second helping. We apply that same “more is more” philosophy to the goodies we offer our guests in the afternoons. 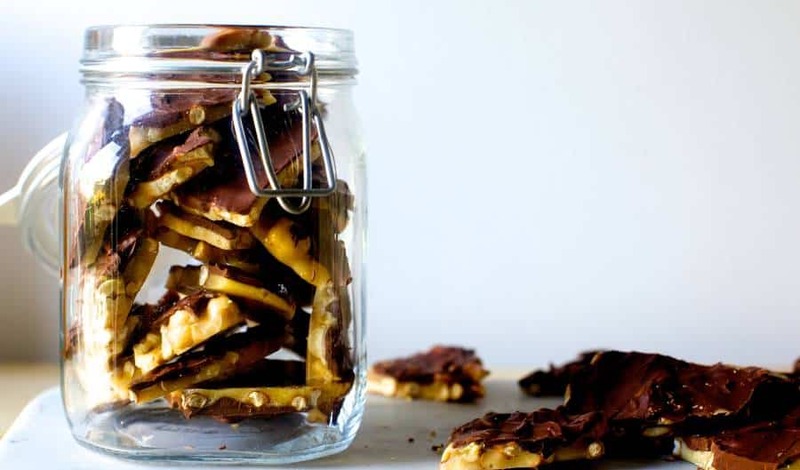 While we love a heaping plate of warm cookies as much as the next person, this Chocolate Peanut and Pretzel Brittle is really speaking to our sweet tooth these days. Either grease a large cookie sheet or line it with parchment paper or a nonstick baking mat. Combine sugar, corn, or golden syrup and water in a medium saucepan, stirring just until sugar is wet. Attach a candy thermometer and heat over medium-high heat, without stirring, until mixture reaches between 300 and 305 degrees F. If you don’t have a candy thermometer, you’re looking for a small amount of the mixture dropped into cold water to separate into hard, brittle threads. Remove from heat and quickly stir in butter (until it melts), baking soda, peanuts and pretzels until all are coated. Pour quickly onto prepared pan. Use a spatula or, even better, two forks to pull and stretch the mixture as flat as you can get it, working quickly. Sprinkle with chocolate chips and let rest for 5 minutes so that they soften. Once they are all soft, use a spatula to spread them over the brittle. Put it directly in the freezer for 20 minutes, after which point the chocolate is firm, the base is cold. Break the the brittle into bite-sized chunks.